Wow, what a thrill to have completed our first International performance! Dear Region 17, we cannot begin to thank you enough for your outpouring of love, support and well wishes! Surefire is so proud to have represented you in Las Vegas, and to have shared that stage with Naturally and Grand Rapids Chorus as they delivered those beautiful performances! 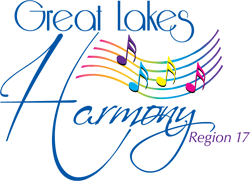 We so look forward to seeing many of you around the Region over the next couple of months for many of our choruses' upcoming shows; and to seeing you all in February at the Harmony Weekend in Huron! Wow, Wow, WOW! Surefire is flyin' high and wants to thank our Region 17 family for an incredible contest weekend! We were so proud to share the stage Friday night with our fellow quartets- such a high caliber group of heart and talent. You inspire us, and we are grateful for your friendship. A special congratulations to Naturally on a beautiful performance and on securing a coveted Wildcard spot in the upcoming International Convention in Las Vegas!